"I’m enjoying London. I’m going to knock someone out"
Champ also meets Sir Jerry Mateparae who predicts Parker will be mates with Fury after the bout despite a strained build-up to the fight. Joseph Parker has cast a ‘special vote’ ahead of the New Zealand General Election at New Zealand house in London today. The WBO World Boxing champion has also been welcomed by the New Zealand High Commissioner to the UK, Sir Jerry Mateparae. 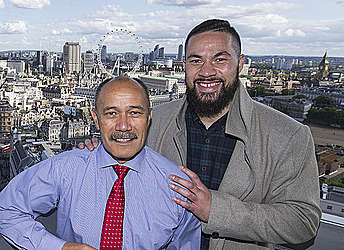 Sir Jerry, the former SAS soldier, who rose in the ranks to become the chief of the NZ Defence Force, and more recently held the post of NZ Governor General, has shown Parker the panoramic views of London from the top of the New Zealand Consulate in Central London.